We are honored to invite you to a journey beyond words through the sacred temples along the Andes. During ten days of traveling and ceremonies the Paqos (Andean priest healers) will introduce and guide you through the most magnificent Inca places. They will work with you in ceremonies on a deep level and immerse you in the energy of the Pacha (Earth) and the cosmos. The Paqos will share their most sacred ancient ceremonies and rituals to reconnect you with the ancestors. 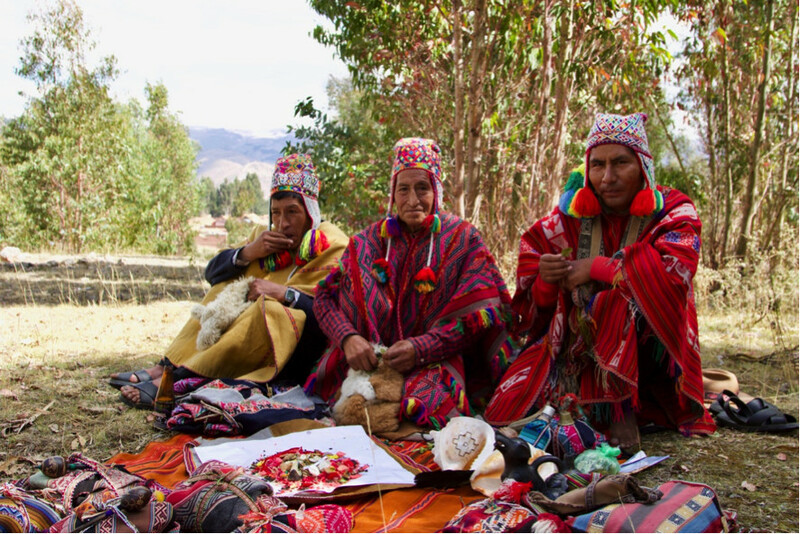 These traditions of the Inca medicine people have been passed down from generation to generation for thousands of years. You will have the unique opportunity to join the Paqos in order to reconnect with your past and your future. In part, the journey may be physically challenging, as we will be travelling between altitudes of 2400 and 4600 meters. This means that the journey will be more easy and enjoyable if you are in a good shape beforehand. We will start in the Sacred Valley situated at 2800 meters, then continue on to Machupicchu and then to the powerful mountain Ausangate. The trip is organized and lead by Luis Alejo and the Paqos from Peru with the cooperation of Daniel Donciu. Upon arrival at the airport in Lima, the capital of Peru, we will be met by an affiliate who will take us by a private transportation to our selected hotel in Miraflores. Miraflores is located in a lovely residential area next to the Pacific Ocean. Alternative from Europe: We can book an overnight flight to Lima (e.g. LAN Airlines via Madrid) with direct connecting flight to Cusco in the morning. In the morning a private van will pick us up from the hotel and take us back to the airport in Lima, where we will take our flight to Cusco. There will be a guide waiting to greet us in Cusco Airport holding a sign with our group’s name. Our guide will give us details about our upcoming trip and itinerary and will accompany us to our hotel, located in the Sacred Valley in the town called Pisaq. The afternoon here is for resting, relaxing and acclimatizing in order to avoid altitude sickness. On this day we will attend the opening ceremony facilitated by the Paqos. First we will visit the arqueological park of Sacsayhuaman. This is considered to be a Temple of the Lightning for the Inkas. We will explore this beautiful area and then we will make our way to the Temple of the Moon to do the opening ceremony. This ceremony will be accompanied by a powerful ofering to Mother Earth. On this day we will travel by minibus to the base of Apu Pachatusan. This mountain is considered, since ancient times, to be the doorway to the universe. Here we will visit the arqueological park of Tipon with its amazing hydraulic system. At the base of this mountain the Q’ero elders shamans will offer a ceremony to cleanse our bodies with the water coming from this powerful mountain. On this day we will visit the archeological site of Pisaq. Here we will discover several major Incan holy temples. The Q’ero Paqos will be facilitating a ceremony here that will take place in a stunning location designed to facilitate our deepest connection to the vision of the falcon. After the ceremony we will explore the colorful market in the main town of Pisaq. The market is renowned for the exquisite arts and crafts brought in by many native artisans from the surrounding communities. There are many different handicrafts available, including textiles, weavings, ceramics, ponchos, and much more. On this day our minibus will take us to Ollantaytambo. Ollantaytambo was the royal estate of the Inca king Pachakuti who conquered the region, built the town and a ceremonial center. It also contains rock walls of tightly fitted blocks weighing up to 150 tons each. These were moved down a mountain and over a river canyon, 1000 ft high. It is one of the world’s greatest wonders and mysteries. Here we will visit the main temples dedicated to a number of important Incan deities. Our guide will also explain the archaeological importance of these Incan sites. Later in the day, we’ll climb to the Temple of the Wind where the Q’ero paqos will facilitate a ceremony. After the ceremony, we will go down to the town of Ollanta to take the train to Aguas Calientes (Machu Picchu). On this day we will visit the world’s most renowned archaeological site and sacred sanctuary, Machu Picchu. During the tour, we will visit some of the most exquisite examples of the Incan architecture to be found anywhere in Peru. Streets, squares, fountains, and ceremonial temples are surrounded by lush vegetation. The citadel is located at a height of 2490 meters (8169 ft). From here, we can see the sacred mountains (apus) like Wayna Picchu, Putukusi, and Inti Punku, as well. Machu Picchu also is known for its astronomical alignments and observatory. The Intihuatana Stone (Hitching Post of the Sun) has been shown to be a precise indicator of the date of the two equinoxes, the December Summer solstice and other significant celestial periods. It is said that touching one’s forehead to this stone will bring many blessings and insights. There is also an option to climb to the top of Wayna Picchu. Only 400 people can climb daily so if we intend to climb we will need to book in advance. This will have an extra cost. It is a steep hike, but well worth the effort if your physical condition can manage it. Wayna Picchu is a sacred feminine mountain that is a counterpart to the masculine, Machu Picchu. Wayna Picchu is connected to the child aspect and youth, while Machu Picchu is connected to the ancestors and crystals. Later in the afternoon we will take the bus to Aguas Calientes for lunch and then take the train to Ollantaytambo where our bus will be waiting to pick up us before going on to Cusco. Meditation at the base of Machu Picchu mountain. On this day we will depart from Cusco by private minibus to Pacchanta Village (4.100 m) which is located south east of Cusco. The duration of this journey is approximately 5 hours. We will travel over steep mountain slopes with green agricultural fields and terraces. Throughout this terrain, we will see many little villages with shepherds guiding their herds of lamas and alpacas. Once we reach Pacchanta Village we will have food and some time to rest and then we will start our hike towards the base of the Ausangate Mountain where we will camp. Time for our hike is approximately 3 hours. We will hike from 4200 meters altitude in Pacchanta Village to 4600 meters altitude. There is an option of renting a horse if you feel too tired or you just enjoy riding. Apu Ausangate (the sacred mountain of Ausangate) is considered to be the most significant mountain for the Q’ero people. Another name for Apu Ausangate is the “Lord of Manifestation” and it is also related to grounding and the sacred directions. Ausangate and the holy lagoons in the surrounding area are well known as powerful sources of energies for the Paqos. Here the Paqos will facilitate a ceremony to honor the holy mountains and to reconnect us with our destiny star. After the ceremony we have the opportunity to bathe in the healing hot springs at the base of the Ausangate mountain. So remember to bring your bathing suit with you. After breakfast we will hike back to the village of Pacchanta. Once in Pacchanta our private transportation will pick us up and take us to T’inki and then to Cusco. Transfer to the airport in Cusco and homeward bound. •	Camping equipment: sleeping bag -4, mattress and tent. •	Private transportation and train tickets to Machu Picchu. Note: Although carefully anchored in an energetic “template” as well as in detailed practical advance planning, this itinerary remains “subject to reality.” It is the nature of pilgrimage and apprenticeship that some things may change at the last minute. In our experience, the few changes that occurred on our previous journeys often opened the door to unforeseen (and usually wonderful) opportunities. Thank you in advance for your flexibility and willingness to adapt, to take advantage of the ever-changing possibilities inherent in a fluid shamanic universe! Places for this trip are limited to 10. The price for this trip is 2150 US Dollars. This price only includes what is detailed above at the Included paragraph. For people that want to be in a single room there will be an additional cost of 287 US Dollars.